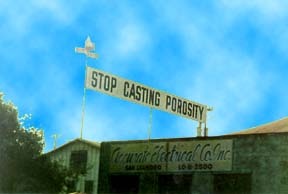 Driving south on highway 880 through Hayward one passes a large sign saying "Stop Casting Porosity" on top of an industrial building. Stop Casting Porosity. What are we to make of this? Is it like Stop Casting Aspersions? Does someone have it in for an actor named Malcolm Porosity? Assuming that it refers to metal die-casting and the attendant, presumably undesirable, phenomenon of porosity, why is the sign directed to random people driving by on the freeway, rather than to the workers doing the actual casting? Is there an even more strident sign inside the factory? A few years ago I made a T-shirt with "Stop Casting Porosity" on the back in block letters. Every so often, while I'm wearing this, another 880-driver stops me and asks, almost in desperation, if I know the key to the mystery. I smile sadly and shrug.